Destined to become a new summer salad to add to the cucumber and tomato list for the summer is Yotam Ottolenghi’s Raita a perky yogurt dressed salad of cucumbers, tomato and red onion sprinkled with fresh cilantro and mint then chilled, what a fabulous addition to any cookout and comes together quickly for a last-minute salad option. That is to say if you shop like I do and grab whatever is fresh at the vegetable stand. Luckily I did a quick small batch of preserved lemons last week and perfect or the salad, but if you don’t have any, use a little more lemon in the dressing and grate a little zest over the salad before mixing. Make the dressing in a medium bowl, use a microplane grater to grate the garlic and ginger over it. Stir in sugar, lemon, chile, seeds, half of the mint and cilantro and season it with salt to taste. Set aside until you’re ready to serve the salad. Cut the cucumbers in half lengthwise, then each half three more times into long wedge-shaped pieces. Cut them into 1 to 1 1/2-inch lengths on a diagonal and add them to a big bowl. Pile tomatoes and onion on top and when you’re ready to eat, mix half of the dressing with the salad. 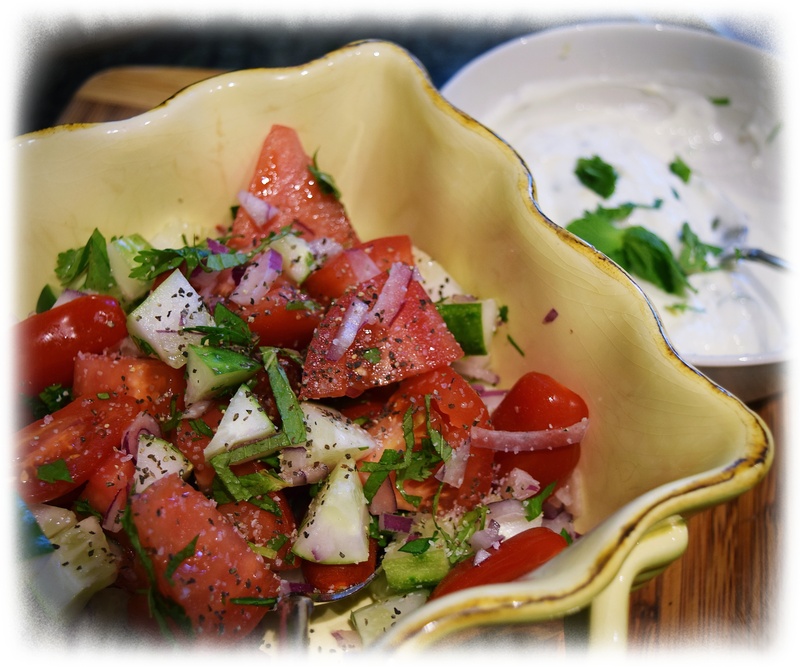 Sprinkle with remaining mint and cilantro and serve with extra yogurt dressing on the side.